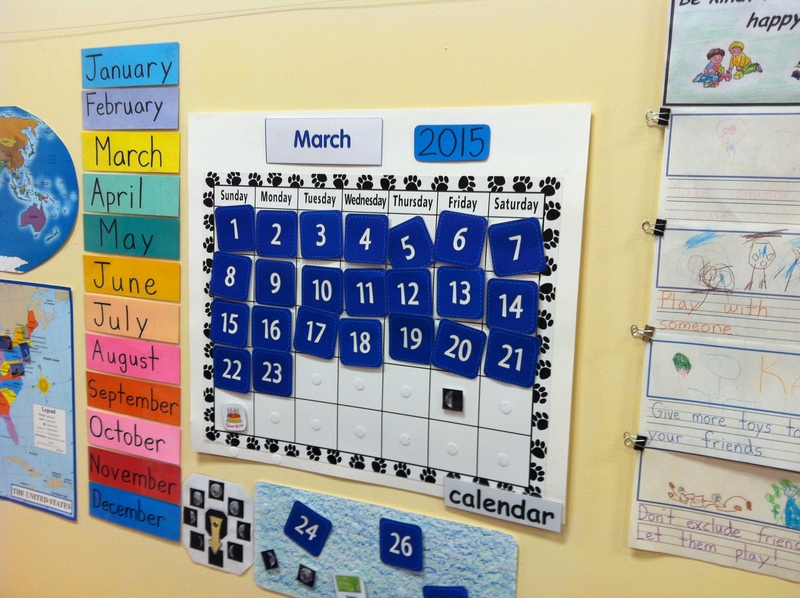 Classroom calendars have been a mainstay in preschools and kindergartens for some time. You can find one in most classrooms. While some teachers have rejected calendar routines altogether, my feelings are more equivocal. The daily calendar routine often represents a bit of a contradiction. Educators who scorn teacher-directed activities—or anything that has the flavor of direct instruction—paradoxically ask their students to sit and listen while they go over the calendar. If only one part of the day involves group instruction, then the calendar is a poor way to spend that time. It can become excessively repetitive, and its utility has limits. However, calendar routines retain some considerable value. Here are some reasons I chose to keep the calendar but diminish its role, instead of removing it entirely. Young children often struggle to comprehend temporal language, yet we can’t avoid using such language with them. They ask “When?” question on a regular basis, and the words at our disposal—yesterday, next week, tomorrow, in the summer, last night, etc.—have limited meaning for young children. That may seems an acceptable reality; generally, when a lesson is too challenging for children of a certain age, we simply postpone it. But young children are frustrated and confused by their failed grasp of temporal language. They want to know what is happening in their lives and when. If they’re better able to anticipate events, they can prepare for them, which gives them a sense of control, perhaps even fostering some self-efficacy. A calendar is a great tool for teaching about the passage of time, of course. It’s a visual representation that gives children a feel for how quickly the days, weeks, and months pass. Whenever a question arises about when something has happened or will happen, we reference our calendar. It is particularly valuable when preparing my students for a change in routines. As one example, before my recent vacation, I pointed out to my students which days I would be gone and when I would be returning. It helped quell some anxiety. We count aloud, as a group, while a designated student points to all the numbers that have already passed in the month. Learning to count requires repetition. I find that repetition is especially helpful with numbers in the teens. Counting together can also help children learn to count with one-to-one correspondence (saying one number for each item). Also, children have a chance to practice recognizing numbers. When it’s time to add a number to the calendar, I ask a student to look at the previous number and figure out what comes next. I say, “What comes after 12?” or “What’s one more than 12?” Early in the school year, many students have to back up and count a string of numbers leading up to the number in question (e.g., “8, 9, 10, 11, 12… 13!”). After some practice, most students no longer need to do that. It’s an important skill—one that Common Core for kindergarten specifically addresses. We often look at the calendar to figure out how many days remain before a holiday or event. For example, I might say, “Today is April 19 and Earth Day is April 22. How many more days until it’s Earth Day?” Once, I even wrote out the problem (19 + __ = 22), a very challenging yet throught provoking representation. Our calendar is messy, with its seven-day weeks and its years broken into uneven months (there has to be a simpler way! ), but it nevertheless offers a chance to apply numbers in a meaningful and engaging context.